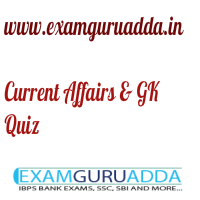 Dear Readers Examguruadda.in presents Current Affairs Quiz Questions and Answers of 9-10 April 2017 that cover important current affair events. Current Affairs quiz for IBPS PO,clerk, RRB-Po,Clerk, SBI, NIACL,Railways and SSC Exams. 1. What is the India’s rank in the WADA’s Anti-Doping Rule Violations (ADRVs) report for year 2015? 2. Who has been appointed the new Executive Director (ED) of Reserve Bank of India (RBI)? 3. Which state government has started Gunotsav programme to improve elementary education? 4. Which committee has been formed by the Uttar Pradesh Government to implement farm loan waiver decision? 5. The famous Berhampur Thakurani Yatra festival has started in which state? 6. Ikutaro Kakehashi, the Roland founder and digital music pioneer has passed away. He hailed from which country? 7. Which country will become the world’s first country to neutralise gender pay gap? 8. The Dibang Wildlife Sanctuary (DWLS) is located in which state? 9. What is the current reverse repo rate, as per first bi-monthly monetary policy review for 2017-18 of the Reserve Bank of India (RBI)? 10. India and the United Kingdom (UK) will set up how much amount of Green Growth Equity Fund (GGEF) to finance clean energy projects? 11. What is the India’s rank in the world’s largest tourism economy in terms of GDP, according to the latest report of the World Travel and Tourism Council (WTTC)? 12. Which movie has won the Best Film award in the 64th National Awards-2017? 13. India has signed defence deal with which country for advanced Medium-Range Surface-to-Air Missile (MRSAM) systems?